The 37th Motek international trade fair for automation in production and assembly and the 12th Bondexpo international trade fair for bonding technologies will earn high ratings with an extensive supplementary program in Stuttgart from the 8th through the 11th of October, 2018. Best practice will be presented here with close correlation to actual, day-to-day industrial routines. Human-robot interaction will support flexible production with small lot quantities and high levels of complexity in the future. 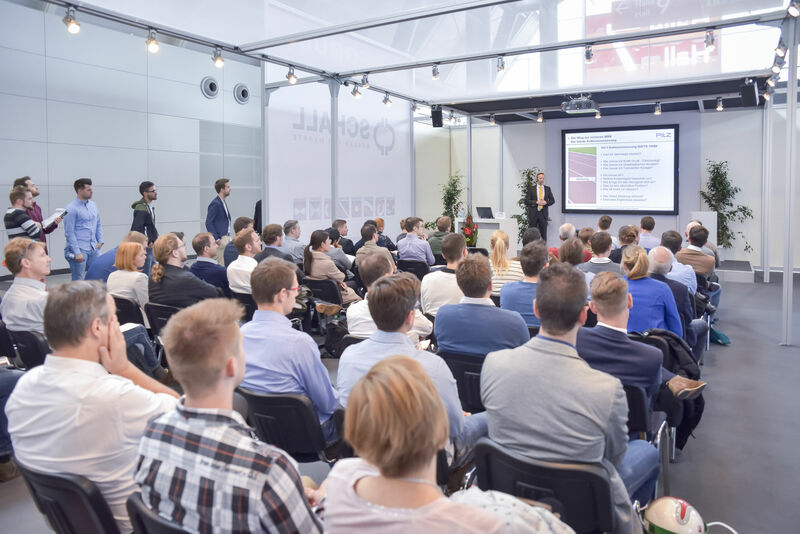 The issue of safety at this interface between people and machines will not be neglected at Motek and Bondexpo: the expert forum on “Safety + Automation”, which was introduced very successfully last year, will be held for the second time in hall 8 on the first day of the trade fair. It will be organised by collaboration partner PILZ. With roughly 400 participants, the new format was a great success last year. Numerous highly practical presentations will deal with Safety Architecture 4.0, occupational safety legislation, CE processes and safe human-robot interaction. Interested parties can view the agenda here: www.sicherheitundautomation.de. A great variety in an amalgamation of all types of companies – from start-ups right on up to global players. They demonstrate in the form of scenarios how a great variety of competence centres work together intelligently for the benefit of the user on a digitalised, solutions-oriented basis in an issue and process-specific manner. Beyond this, partner association VDI (Association of German Engineers) will hold its “VDI Forum: Digitalisation in Production”. With its numerous expert presentations, it’s intended to make a valuable contribution to a better understanding and more acceptance of digitalised production in small and mid-sized companies. The series of events also deals above all with practical opportunities for taking advantage the flow of information in production. The exhibition organizer P.E. Schall self-organized exhibitor forum has enjoyed great popularity for years. This platform has been enjoying great popularity for years. During the course of alternating presentations, world-class speakers from exhibiting companies report on modern, high-performance production and assembly automation in theory and in actual practice. The range of presentations covers all relevant disciplines from the suitability of components for certain requirements right on up to field reports on the use of processes and flexible assembly systems. Interested parties who would like to gather information about the trade fair’s portfolio of offerings in accordance with their own needs can make use of the special trade fair guides covering “Assembly Systems Fabrication”, as well as “Joining Technology”.